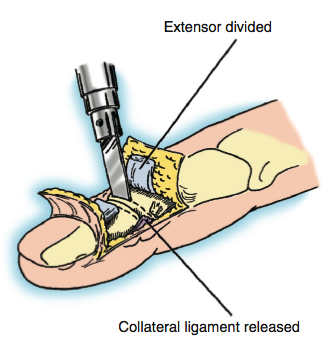 Arthritis of the Joints in the Finger Handout | Dr. Thomas Trumble, M.D. What is Arthritis of the Finger Joints? Arthritis of the finger joints can come from osteoarthritis, which is a broadly inherited condition. It is common in many different racial groups, but most common in Caucasians. Traumatic arthritis occurs after chronic history of injury, such as prior fractures or dislocations that have gone on to damage the cartilage and cause early degeneration. Rheumatoid arthritis is a condition that is systemic where antibodies actually attack the patients’ joints. Pain and swelling are the hallmarks of arthritis of the fingers. However, deformities can occur such as the fingers beginning to angle toward the thumb or away from the thumb. The result is a loss of function (barely being able to do strong gripping activities and fine motor activities). The presentation depends on the type of arthritis. Patient with osteoarthritis develop bone spurs or osteophytes, which grow outside the confines of the normal architecture of the bone. 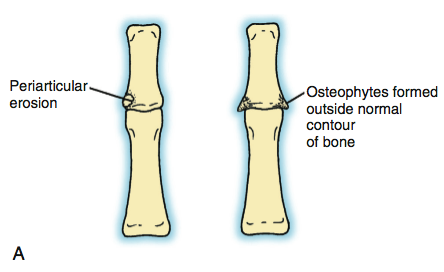 Patients with rheumatoid arthritis develop erosions and cysts within the normal architecture and takeaway from the bone (Figure 1A and B). 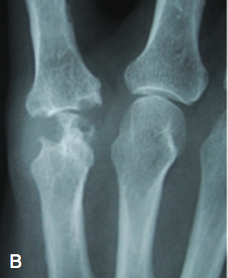 Traumatic arthritis is often evidence of an old fracture or dislocation. As noted above, this can occur in individuals who have a history of trauma, a history of osteoarthritis, or history of rheumatoid arthritis. It is important to differentiate the type of arthritis and the other associated injuries, particularly in rheumatoid arthritis. It is very common to have a great deal of damage to the supporting ligaments, which makes the treatment of the arthritis more difficult than osteoarthritis. 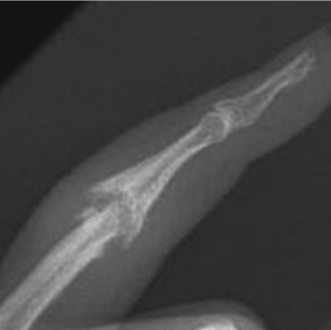 How do we diagnose Arthritis of the Finger Joints? How do we treat Arthritis of the Finger Joints? For most mild cases, a general course of therapy and non-steroidal anti-inflammatory medications (NSAIDS) can be very helpful. When there is acute swelling and pain, an injection with corticosteroids can be helpful. 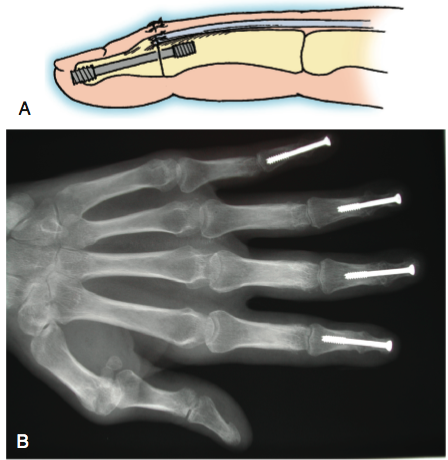 When there is a deformity of the digits (particularly with angulation) a program of serial casting with therapy can help minimize the severity of the deformity. When the joint has become stiff and painful, despite conservative treatment, surgery can be indicated. For the fingers that develop severe deformity for either the PIP or DIP joints, a fusion with the bones that are permanently fixed together can provide relief and stability. However, this completely eliminates motion (Figure 3). 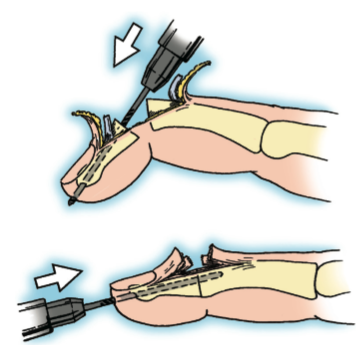 The DIP joints tolerate this fusion to a much greater degree because motion of this joint is not as critical for overall function of the hand (Figure 4, 5, 6). When the arthritis only involves one or two fingers with the severe loss of motion and pain while the other digits are functioning normally, joint replacement can be indicated. This can include a flexible silastic implant, particularly in rheumatoid arthritis whereas more rigid joint replacements that articulate that is moved one surface on top of another surface similar to knee replacement surgery can provide pain relief and good function. 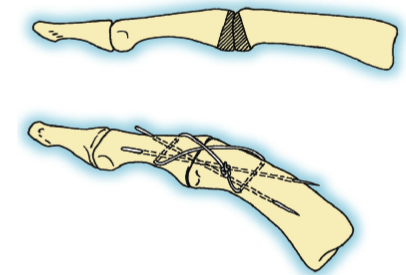 When the fusions are performed, it is only necessary to provide some protective splinting until the bone can solidly grow across the fusion site. When joint replacements are performed, it is important to begin therapy within five to seven days and follow a very careful program of motion to prevent stiffness while still protecting against dislocation of the implants. Fusions, delayed healing, symptomatic implants for the wire, pin and screw fixation that may require later removal. Difficulty coordinating digit motion with some digits having a fused joint and no motion and other digits having a greater arc of motion that does not move in synchrony with the other digits. Joint replacement concerns include stiffness, infection, dislocation and recurrent deformity. Complications are rare and in general, the patient is going to expect substantial pain relief and improved function.